Da Lobsta, which has taken Chicago by storm with its creative, delicious take on the Lobster Roll sandwich plus other lobster delights, has added some refreshing and fun items to its menu for summer. Da Lobsta has two locations: The Gold Coast location is at 12 E. Cedar St. in Chicago (312-929-2423) and the Chicago French Market location, in the French Market, is at 131 N. Clinton St. in Chicago. As a starter or side dish, the Lobster Deviled Eggs (four for $6; available at the Gold Coast location only) are a cool enhancement to your meal or simply a delicious protein-rich snack. These chilled bites of yumminess are topped with chunks of lobster—the deviled egg never had it so good! If you thought sliders were just about burgers, think again. Da Lobsta has created the Hawaiian Lobster Sliders (three for $12; available at the Gold Coast location only), a trio of mini-sandwiches featuring chunks of lobster meat, fresh pineapple and mayo, served on a mini-Hawaiian bun. 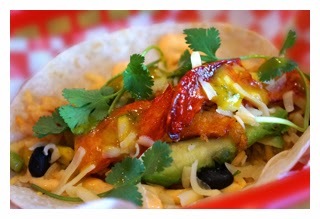 When you’re in the mood for a luscious taco fix, Da Lobsta has come out with two tasty versions. The Da Lobsta Lobster Taco ($8 each or two for $12; available at the Gold Coast location only) features chunks of succulent lobster meat, Mexican rice and black beans topped with Sriracha mayo, avocado, Chihuahua cheese and cilantro. 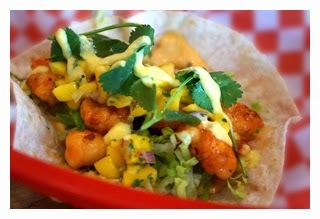 The Mango Chipotle Shrimp Taco ($6 each or two for $10; available at the Gold Coast location only) features shrimp, mango, chipotle mayo and cilantro. Poutines are another hot trend this summer and Da Lobsta is right on top of it, with its kettle Chip Lobster Poutine ($6.50). Served right in the bag, this pe rfect snack features house-made cheese sauce, Chihuahua cheese and chunks of lobster meat. Da Lobsta’s new Lobster Pasta Salad ($6 for 12 oz. ; available at the Gold Coast location only) features chilled pasta, chunks of lobster meat blended with herbs and mayo. Salad lovers have two new items to try this summer. The Lobster Kale Salad ($12.95; available at the Gold Coast location and the French Market location) is Da Lobsta’s salute to kale, the very popular and healthful green. The salad combines chunks of lobster meat, fresh kale, roasted corn and peppers, and feta cheese tossed in a zesty vinaigrette dressing.